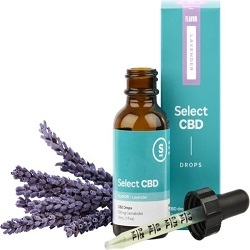 Restore and uplift your body and mind with Lavender CBD Oil. Cannabis Oil has been used in medicine for centuries but has only recently come to light for the therapeutic value it offers. The compound cannabidiol has a very low toxicity and relatively benign side effects. Research is beginning to show that CBD is different than other well-studied cannabinoids. CBD, cannabidiol, is one of over 60 compounds found in cannabis that belong to a class of ingredients called cannabinoids. the primary, non- psychoactive component of Cannabis sativa. and has been used as an anti-inflammatory, anticonvulsant, antioxidant, antiemetic, anxiolytic and antipsychotic agent. All cannabinoids act as ligands, meaning they dock onto the binding site of a protein and can modulate receptor behavior. CB1 receptors are widely distributed in our cells but are particularly abundant in areas of the brain, including those concerned with movement, coordination, pain and sensory perception, emotion, memory, cognition, autonomic and endocrine functions. While CB2 receptors are found primarily in the immune system, they seem to reduce inflammation and certain kinds of pain, like those emanating from neuroinflammation, epilepsy, oxidative injuries, vomiting and nausea, anxiety and schizophrenia. Although cannabinoids all have similar structures, they display a wide array of actions at each of the different receptors. Most marijuana plants grown specifically for recreational purposes are typically very low in CBD and high in THC tetrahydrocannabinol, which has very little effect on CB1 and CB2 receptors. This explains why CBD doesn't have the same mind-altering effects and may prove useful in pain modulation by inhibiting neuronal transmission in pain pathways. A 2012 study published in the Journal of Experimental Medicine found that CBD significantly suppressed chronic inflammatory and neuropathic pain in rodents without causing analgesic tolerance. Studies show that Cannabidiol is effective in reducing anxiety in patients with social anxiety disorder and may also be effective for panic disorder, OCD, schizophrenia, and post-traumatic stress disorder. Several scientific reports demonstrate that CBD benefits include possessing antiproliferative, pro-apoptotic effects that inhibit cancer cell migration, adhesion, and invasion. A 2006 study published in the Journal of Pharmacology and Experimental Therapeutics found for the first time that CBD potently and selectively inhibited the growth of different breast tumor cell lines and exhibited significantly less potency in non-cancer cells. As with all hemp products, there is a chance that consumption could trigger a positive drug test. Consult your doctor and/or employer if this is a concern. FREE SHIPPING ON DOMESTIC U.S. ORDERS OVER $75!